The little bit of peace you experience in meditation gives rise to a bit more peace, and then a little bit more and so on until finally you can weave that continuum of peaceful moments together and find yourself enjoying peace for one minute straight. Imagine one minute of peace. If you can imagine one minute, you can imagine two and then three and so on, until finally you're peaceful for an hour and then two hours and then a day and then a week and then your entire life. Inner peace gives rise to more inner peace. Cherish those moments in your day when you are peaceful. Think, "This is my nature. This little bit of peace bespeaks my actual nature. Deep within my heart exists the potential for lasting freedom." Change the way you identify with yourself from someone who is disconnected from peace, to someone who is deeply plugged in, connected to peace moment by moment. If possible, sit in meditation for one minute, two minutes, five minutes etc, and deeply familiarize yourself with this understanding. It will revolutionize your life. At the time of death, which is definitely coming your way, the only thing you can rely upon is a peaceful, relaxed, accepting and happy state of mind. So train in developing that peaceful mind now within your daily life. Don't wait until the time of death to train in meditation, it will be too late. One of the most important objects of refuge for the spiritual practitioner are those other spiritual practitioners who are also putting the Dharma, Buddha's teachings, into practice. In Buddhism, we call our spiritual friends "Sangha." Sangha is a Sanskrit word, which translates to "the supreme assembly." It's such a beautiful word and it has such deep meaning. 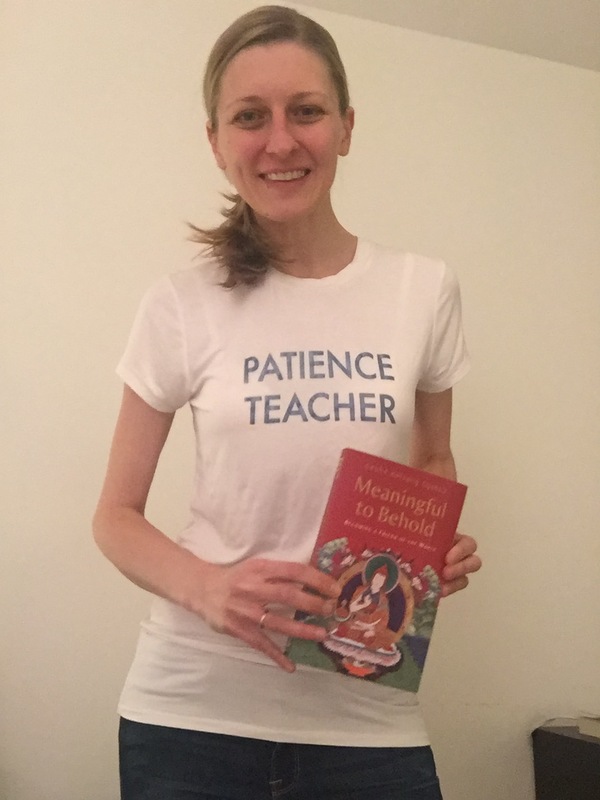 For more information please see Geshe Kelsang's book Joyful Path of Good Fortune, as it describes in greater detail the different levels of Sangha. Our Sangha friends inspire us and show us how it is possible, in their own unique way, to incorporate inner peace into daily life. We are so lucky to have spiritual friends. Of all of our different relationships, the relationship we have with our spiritual friends is arguably the most important. We share something very intimate with them, our heart connection to the enlightened beings and inner peace. As spiritual practitioners, we've decided to take a different path with our life than many of our other friends and family members. We decided to take an inner journey, an inner adventure, going inside our mind and uprooting the causes of suffering, instead of always looking outside ourself for satisfaction and distracting ourselves through temporary sources of pleasure. Without Sangha friends this journey is nearly impossible. As Geshe la says, "Without others we are nothing." We need spiritual friends; we can't travel this journey to enlightenment alone. We definitely need help. The function of the meditation center is to foster and facilitate spiritual relationships/friendships. Our delusions of anger and attachment are strong and they create many difficulties in our life. We often find ourself stuck and confused. With the sound advice and support of our spiritual friends we can resolve our difficulties quickly. We need spiritual friends to offer us 'wisdom advice' generated through a peaceful, controlled, compassionate and wise state of mind. Many people can give us advice but the advice we receive from our spiritual friends is the most excellent advice. It's advice that arises through the experience of meditation when conjoined with wisdom and compassion. Eventually, our spiritual friends can also function to point out our faults. Friends that always agree with what we say and tell us what we want to hear, instead of what we need to hear, can be deceptive. If we have an open, humble heart we can use the advice of our spiritual friends, even if it's difficult to hear, to quicken our path to inner freedom. Of course this type relationship needs to be fostered gently and gradually in order to be based on trust and understanding. If nurtured properly, such a relationship is extraordinarily valuable. It's a true spiritual relationship; one that transcends this one life because the advice we receive from our spiritual friends is not only helpful now but is also helpful in all of our future lives. How lucky we are to have the opportunity to cultivate such relationships. How kind of Geshe Kelsang and all the Buddha's to offer us the gift of a different kind of relationship. We contemplate, "How fortunate I am to have spiritual friends. They inspire me, guide me and offer me the best advice. They also function as a mirror reflecting back the blind spots within my mind that need more attention in meditation. I have many relationships in my life but my relationships with my spiritual friends are the most valuable because their advice transcends past this one fleeting life. Their advice to always solve my problems through wisdom, patience, love and compassion is supreme, practical advice that protects me from negative actions that only result in suffering." Through this contemplation, when a feeling of good fortune and appreciation for these spiritual relationships, as well the wish to become an equally supportive Sangha friend ourself arises in our mind, we gently enjoy and abide with this feeling and determination. Amanda P shares her experience, "I walk away with a new insight from every class - whether it's a new way of perceiving a common situation, an eloquent solution to a problem, or understanding a concept I learned in a previous class on a deeper level. I still have a long way to go, but I felt deeply connected to Joseph's teachings immediately in a way that I haven't experienced with anything else. Joseph's teaching style is relaxed and perfect for Williamsburg - at points it's like Buddhist comedy hour. 😉 The questions in class show you that everyone is wondering about and struggling with the same issues. :) The classes have a Buddhist foundation, but they're more like LIFE 101. Required for everybody! I've learned so much about where other people are coming from and feel more empathetic, more loving, and more connected. After a couple years of attending classes, I've started to explore these concepts on a deeper level in ways I never thought possible. There's such an amazing community, and my friendships keep growing. 💗 The beautiful new space is the perfect place to hang out on Sundays after class. Much love! xo"
Meditation: Too Good to Be True? *It is recommended that you attend the course in its entirety. Single-session registration is not available online, but walk-ins are welcome for those who cannot attend both sessions. Is it true that a modest but consistent meditation practice can steer you toward a more positive life? Yes. Is it true that people and circumstances that currently bother you can cease being problems simply through meditating daily? Yes. Is meditation too good to be true? Not at all. If you’re looking for a way to produce meaningful change in your life, you need to go inward. Meditation takes you there. Through this half-day course – which includes teachings, discussion and several guided meditations – you can begin the process of turning things around. Easy, fun and meaningful. Meet, relax, laugh, learn and be inspired by like-minded class members.